Newbury, Vermont, poet Sydney Lea is a dedicated outdoorsman (yes, that means sometimes hunter, but mostly these days just tramping the hills with a dog or two), Dartmouth professor, and author of some of the best collections of New England narrative poetry. 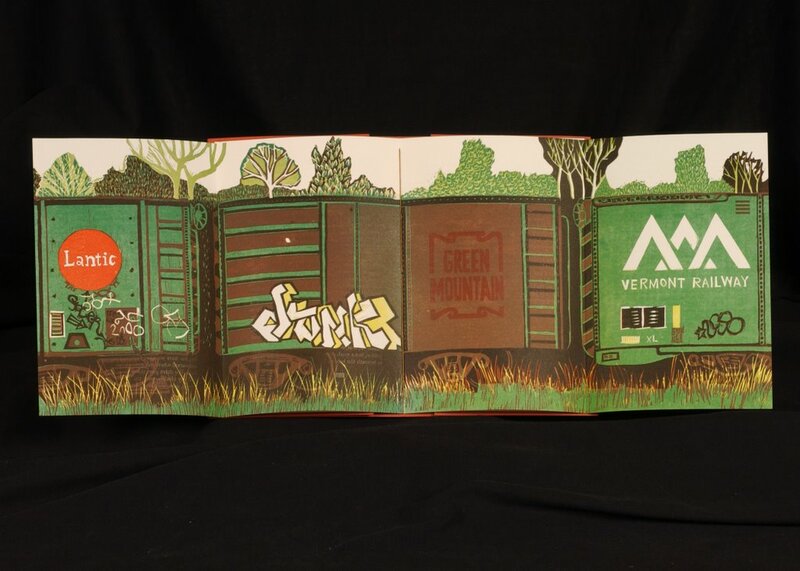 His PURSUIT OF A WOUND was one of three finalists for the Pulitzer in 2000, and his eighth collection, GHOST PAIN, dips into the effort of "recovery" while also nailing the conversations of living in Vermont, word by word by heart by soul. Most recently, Story Line Press brought out a collection of his essays, A LITTLE WILDNESS: SOME NOTES ON RAMBLING. It's a perfect companion for this season of the year, when the flaming leaves have left the northern hillsides and "stick season" marches across the slopes, wet and gray and barren. On Friday November 3 at 3:30 p.m., at the Grace Stuart Orcutt Library on the St. Johnsbury Academy campus (see www.stjacademy.org for directions or call Jean Fournier, library director, at 802-751-2100), Lea plans to read from his newest work, as yet unpublished but with the working title AMERICAN DREAM. He noted last weekend, with a wicked tilt of the head, that this collection is "more political." That may be the enduring legacy of the Bush Administration's actions: that poets, even the ones who'd normally immerse themselves, like Robert Frost, in the struggles of the hill folks and the mysteries of the land, are moved into the arena of American assertion. More on this collection after Syd reads from it -- better yet, come hear him in person. Congrats to Archer Mayor, whose 17th Joe Gunther mystery, THE SECOND MOUSE, drew a warm and enthusiastic mention from New York Times crime fiction critic Marilyn Stasio in today's Book Review section. For a longer review of the book, check our web site tomorrow (www.KingdomBks.com) -- and mark your calendar for Monday November 13, 4 p.m., when Mayor visits Kingdom Books for conversation about the latest in Joe's career (and signing books, of course). We have most of the other Joe Gunther series here, signed, in case you're missing any. To reserve copies, drop an e-mail to us so we order enough... they go like crazy! Fun, good reading, smooth plotting, and set in Vermont -- perfect. When I first thumbed through HERE, BULLET, the notable first collection of poetry from Brian James, I stumbled and had to sit down. This isn't amateur hour from the war, was my startled thought -- it's highly professional poetry from a poet who knows the field. 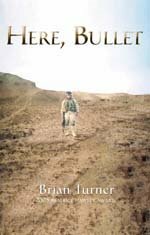 And that, in turn, is why I am delighted this evening to pass along news that emerged October 13, but just caught up with me: The PEN USA Literary Award for Poetry is going to Brian Turner's HERE, BULLET. The award ceremony takes place in December. It will probably wreak havoc with Turner's schedule, as he is much in demand for readings and interviews. In a short, pithy essay for the New York Foundation for the Arts site (http://www.nyfa.org/level3.asp?id=418&fid=6&sid=17), Turner describes himself as having been an "embedded poet" in Iraq. Veteran already of an MFA program, he lived in South Korea for a year, then entered the armed forces (U.S. Army) for seven years (the same as the apprenticeship period for which the biblical Jacob labored to win his wife; hmm). Part of the service took place in Bosnia-Herzegovina with the 10th Mountain Division; the most significant, in terms of HERE, BULLET, was the final year, spent as a buck sergeant in Iraq. in a slow unraveling of feathers and wings. Another facet of this collection to treasure is that despite the clearly personal impact, Turner hasn't tried to turn his sequence of poems into a time-labeled narrative of his year in Iraq. Only the reflective "Night in Blue," near the end of the volume, asking (among other hard questions) "Has this year made me a better lover? ", suggests the transition back to civilian presence in a safer landscape. And instead of "me me me" there is a quiet unfolding of layers, of friendships, of loss and growth. The PEN USA Literary Awards honor more than poetry; they honor a sense of outreach and commitment to the people of a beleaguered planet. Turner's HERE, BULLET is hence the obvious and valued selection for the 2006 award. Congrats to Vermont author Sarah Stewart Taylor, whose fourth Sweeney St. George mystery, STILL AS DEATH, earned a long complimentary paragraph from Marilyn Stasio in Sunday's New York Times Book Review section. Brava! One delight of collecting poetry, mysteries, and fine press work is to catch something great in the first book, the one that others aren't yet aware of -- but that sends shivers down your back as you say, "I really LIKE this one." So here's the good news: There's a brand new press with its first gorgeous offering, and Kingdom Books has three copies available. The press is Crown Ring; the book artist is Sara Owen; and her "fine press genealogy" goes directly to the Univesity of Alabama book arts MFA program, run by Steve Miller (studied with Walter Hamady; founde Red Ozier Press; now he's Red Hydra Press in Alabama). 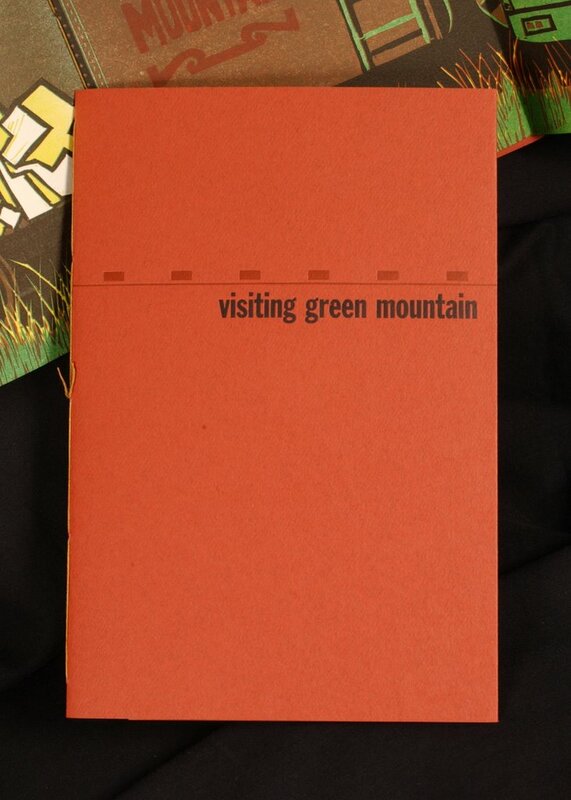 And the book is, Visiting Green Mountain. Printed in the winter of 2006 at U of A, in Walbaum type (letterpress) on Rives Heavyweight, it's a nostalgic mini-memoir of family, of Vermont, and of trains. Covered in deep red with black type, neatly stitched with golden cord, the front free endpages are chestnut brown and the title and closing pages (ivory) are pictorial. 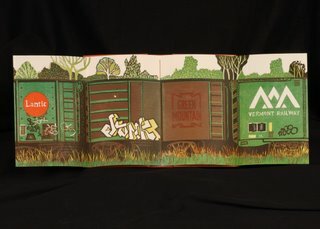 But the stunning heart of this limited edition (only 75 copies) is a double-width centerfold that spreads out to the width of four pages. I'll post images of the cover and centerfold here. It's $45 plus $4.25 postage (Priority Mail). This is Sara Owen's first book. I look forward to adding subsequent ones ... and to enjoying that satisfaction of having spotted the first, when it was still a relative unknown. The Brattleboro Literary Festival began Friday evening, and continues through Sunday October 8. From the strange coincidence mentioned at the opening of Friday's kickoff reading, a haunting and powerful spirit of conversation across cultures and languages fluorished. Here's the coincidence: Both Ilya Kaminsky and Martín Espada, the poets reading that night, became Legal Aid lawyers and worked for the rights and lives of those whose voices are rarely heard, and rarely strong enough. Framing his reading Friday with poems from his earlier book ALABANZA, Espada also gave voice to veterans of the Vietnam war, in the context of the enduring wars in the Middle East. Translation weaves its complex patterns through both poets' lives, also: Espada, a New York Puerto Rican, learned his Spanish as a second language and now it's part of his heart, just as his heart, corazon, is part of a throbbing, drumming voice of poetry that echoes the rhythms of Latin America. And Kaminsky, who came from the Ukraine to the United States as a small boy and who "had to learn English or die," proclaims his poetry with both the heavy accent of his birth language and the rising call of one who has long ago ceased being able to hear "normally." So one of today's extraordinary moments was Espada reading multilingually with Iranian poetry translator Niloufar Talebi. Talebi, lead poet in the afternoon's "Hearts of Spain" exploration of poetry and the Spanish Civil War, is engineering a global translation effort for the poems of Iran -- which has its "disappeared" just as Chile and Nicaragua and many Caribbean islands have experienced. Her presentation of Neruda quickly grew to include Espada and his booming voice, driving the Spanish words into the air like hammered beams, strong, true, visible. When Espada later commanded the podium on his own, working with the words of Vallejo, Hernandes, and more (including some of his own translation work), the packed room shook with his vehemence. And one of last night's unforgettable visions was the four-way poetic performance of (1) Ilya Kaminsky, (2) audience members holding and sharing with each other copies of DANCING WITH ODESSA that Ilya provided to help them understand his voice, (3) a Sign translator for the deaf moving Kaminsky's poetry from the page to her hands and face seconds before Kaminsky spoke the words, and (4) a second translator for the deaf, picking up the text from her collaborator and echoing it, with dramatic gestures and expressions, for those able to lift their eyes from the printed pages. And Turner frames his sections of poems with much older work from the Qur'an and other translations from the Arabic: such as, "Do they not see the birds above their heads, / spreading their wings and closing them?" Vermont is one of the "whitest" states in the nation, and tourism promoters encourage taking this to mean that the state is filled with white-haired wise elders in red-and-black checked wool jackets and jeans, varied by the addition of barn boots or flowery pocketed aprons. This year's Brattleboro Literary Festival reminds us that there's depth and diversity way beyond the tourism imagery -- thank goodness! Featured at the festival, which begins tonight, is poetry rooted in Russia, Spain, Latin American, and Iran. This evening's 7:30 reading kicks off the weekend with Martín Espada (sometimes called THE Latino voice of his generation) and Ilya Kaminsky (not yet as noted as he ought to be; a remarkable young Russian poet who's lived in the US much of his life but who speaks from another drama entirely). Saturday, at 11:45, poet Niloufar Talebi brings the Iranian experience forward, thanks to The Translation Project. 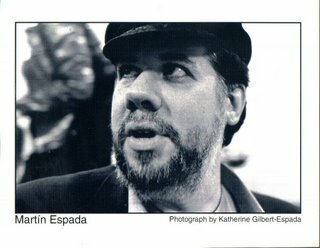 And the 3:15 panel "Hearts of Spain: Poetry of the Spanish Civil War" provokes fresh vision through readings by Espada and also the newly noted poet Brian Turner, author of Here, Bullet! These are my top picks from a rich weekend schedule that also includes poets Maxine Kumin and Chard deNiord, novelist/musician Madison Smartt Bell, Vermont fiction crafters Mary Gaitskill and Jeffrey Lent, and on Sunday an appearance by Jamaica Kincaid. Reminder: Martín Espada reads in St. Johnsbury, through sponsorship by Kingdom Books, on Sunday October 8 at 3 p.m. at the St. Johnsbury Athenaeum. All events are free and open to the public. 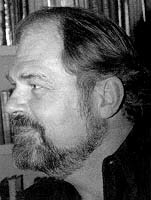 We've posted a review of Espada's new book, The Republic of Poetry, on our web site, www.KingdomBks.com .